We don’t get sick very often, but there was a serious case of Man Cold around here this past weekend. We all know that chicken soup is good for colds and illnesses, but it can be expensive or you might not have any when sickness strikes. 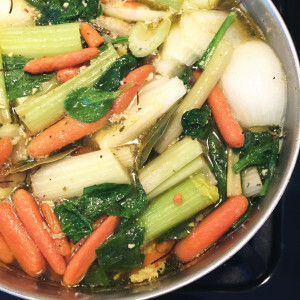 I wanted to tell you how easy it is to make homemade chicken broth. I’ve got a big batch on the stove top right now so we can keep this Man Cold at bay. It is so easy and economical to make that you should make it too. Really you should. Any time we have chicken on the bone in a meal I make chicken broth afterwards. First, just collect all the skin and bones after the meal. Right off everyone’s plates. Really. It will be boiled plenty long to kill any germs. This is what you do. Place the bones and skin in a large pot. I usually use a 2 quart kettle for this. I also like to add minced garlic or whole cloves of garlic and greens like spinach or kale — more vitamins! Add 1 t. salt and 1/4 t. pepper if you like and one or two bay leaves. You can add herbs like rosemary or thyme, which have their own medicinal properties as well as flavor if you’ve got them. If you don’t have all of these ingredients, use what you do have. You could add any leftover vegetables such as green beans or peas you have in the fridge. Anything that adds flavor and nutrients. Cover all ingredients with approximately 1.5 quarts of water. Bring to a boil and then simmer for an hour or more. You can even do this in the crockpot overnight / all day if you prefer. Ta-da! 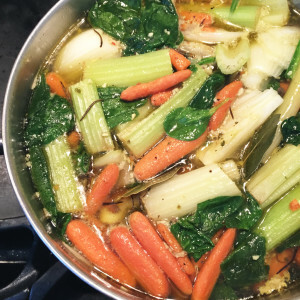 You have a quart or more of wonderful homemade chicken broth, chock full of vitamins and nutrients and no added harmful anything. And it only cost you pennies to make. There are a few more things I do with my ingredients. First, I strain the broth through a colander into a bowl, catching all the bones and vegetables in the strainer. Next, I chill the broth overnight so that any fat will solidify at the top. Then I skim the fat and discard. Now the broth is ready to be used. If you aren’t going to use it within a week, it can be frozen in a plastic container or even a ziplock bag. Then, I sort the stuff in the colander, discarding the bones and skin and bay leaves. All the soft cooked vegetables and any bits of meat off the bones are saved and pureed in my food processor. They will go into my next batch of split pea or other soup. Easy peasy! And now you can do it too. The bonus is that your house will smell really good while it is cooking. Enjoy and keep warm! P.S. If you happen to have beef, pork, or ham bones you can follow the same process for those broths. Sara – I make chicken broth with the discards of every rotisserie chicken I buy (4.99 @ supermarket). Because there’s just me to cook for, I get several meals from the chicken and several more from the broth. I leave the veggies whole when I add them to the broth, so that I can fish them out easier after I’ve extracted all the goodness out of them. I mash the carrots and put them right back into the soup. I discard the onion and celery. They could be pureed by the immersion blender but I like clear soup. I usually include a container of the fresh summer tomatoes that I’ve frozen in the Fall. Shortly before serving, I add fresh spinach and fresh parsley. Sounds perfect, Rita. Yumm-o! I forgot to mention using those lovely deli chickens. Since they are seasoned, they make delicious broth and they are so economical too. I think a bit of ginger would be worth trying too. Too bad I can’t convince my daughter to eat soup! Oh dear. I hope you both survive the Man Cold!